Fernando Alonso of Spain won the first GP of this year by winning the Chinese GP and gave Ferrari its first podium finish. It was a closely contested race, although Alonso had taken the lead in the 42nd lap and then maintained it. 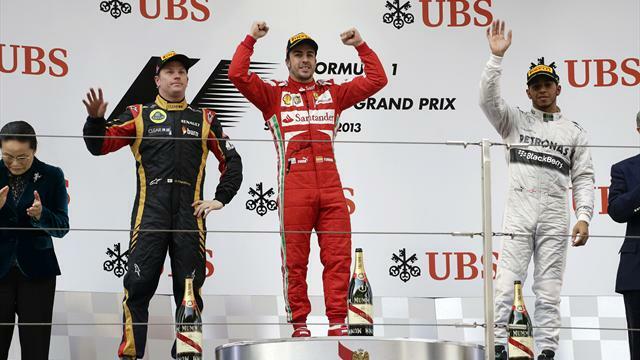 The race was a well planned and strategically won event for Ferrari and Alonso as he started the race with soft tyres. Three times formula 1 champion Sebastian Vettel finished at number 4 by a difference of just 0.2 seconds. Kimi Raikkonen of Lotus was the runner up while Mercedes Lewis Hamilton was third. As the race started, there were two groups of contestants, one with soft tyres at the start while the others with medium tyres at the start. Those who started with soft tyres initially took the lead but had to pitstop early than the rest of the field. The ones who used medium tyres emerged the leaders but at the critical stage of the race, they had to pitstop to change the soft tyres. Alonso used the soft tyres at the start and as a result, took the lead and crossed Hamilton in fifth lap whose tyres had faded by that time. His short pitstops helped him cross Vettel on 42nd lap when Vettel had one more pitstop to go. Thus it was almost impossible for Vettel to catch Alonso. Therefore, his target was Raikkonen and Hamilton. A delay in his final pit stop took him out of podium finish contention Jenson Button was fifth while Mercedes Filipa Massa was sixth. There were more woes for Red Bull’s Mark Webber as he had to retire from the race due to smashing front wing with Jean-Eric Vergne’s Toro Rosso and later falling off of rear right wheel. Nico Rosberg was also retired after his second pitstop due to suspension problem. Paul di Resta and Romain Grosjean finished at eighth and ninth respectively.